January given you the blues? As we vacuum up the last pine needle and shake the glitter out of our party shoes, January is traditionally the month in which we take stock – reset, resolve and restore. So what better way to start a new year than with looking after yourself? Whether you’re going for a bold new style, or simply repairing partied out hair, treat yourself to some much needed ‘me’ time. Have your tresses tended by our expert stylists and while you’re at it take the opportunity to revitalise and enliven your hair with a pop of colour – restoring you back to you. Or maybe you’ve resolved to try something new with your look – not too drastic though – a sliver more platinum in your blonde, a shade warmer and richer for brunettes, or to go all out with one of the latest colour innovations such as ombre hair or a gorgeously bright stick-it-to-January colour. 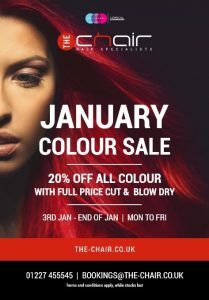 Whatever your colour resolutions you can fulfill them with 20% off this month when you book a cut and blow-dry. See our offers page for more details and terms and conditions (we update offers monthly) and call to book on 01227 455545.